I actually got a shock when I put these on. They're more orange that I expected! I wanted these mainly because I loved the Sparkling Aqua ones. Still like the natural look of the Sparkling series. Thin gray ring on the outside defines the eyes subtly. The lenses are not a solid single colour but rather a blend of warm colours that remind me of Autumn. Goes great with brown & gold eyeliner. Comfort wise, I had no problems with even long-wear. 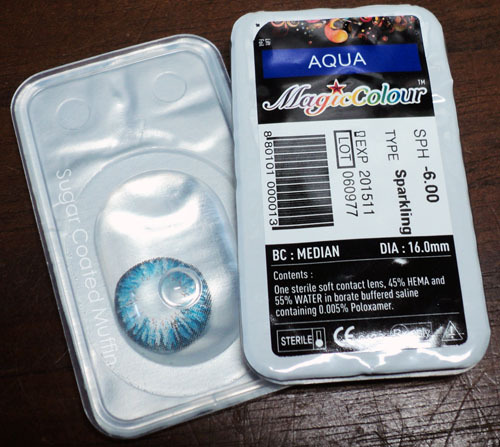 Like the other MagicColour lenses, I felt they were pretty comfy and not so drying. Lovely coloured lenses. I recently purchased a pair of nudy grey and tri-colour purple. Can't wait to get them from my sis! Thanx for your comment and following me. Sorry that I took so long to get back to you. I've extended my giveaway deadline and seeing that you are a new follower, I would love for you to try your hand at winning something. Do participate if you are keen. I saw your other review on this brand on lenses!I went of the site and I don't think they ship to the United States... Anyway, these look really awesome and pretty on you! Ohhh, awesome!Thank you, I guess I hadn't noticed earlier.